“The countdown has begun, but the only thing striking at midnight will be terror. . .
“New Year’s Eve isn’t all champagne and confetti. For some, it’s filled with regrets, the changing of the day dragging them kicking and screaming into a year for which they aren’t prepared. This year, some people will be screaming, but they may not make it to the New Year at all. So, sure, you’ve seen all the hype before, but here’s a chance to get YEAR’S END: 14 TALES OF HOLIDAY HORROR for yourself and see what the fuss is all about. Especially now at a very deep discount, for instant download at just $2.99, down from an original price of $5.99. Want to give it a try? Just press here (and, yes, this has been a brazen commercial, but it is a bargain at this sale price). A cold week’s a-coming, according to the Weather Channel, at least around New Year’s to follow a warmer than usual Christmas week. Wolf weather — howling winds, increasing chill as the moon reaches full on Sunday, January 4. And of course, not all things that howl at the moon are necessarily natural wolves. Especially as the year comes to a close, and people huddle inside by the fire, steeling themselves for the long wait for spring. But if one must go out, what then, especially with a full moon coming on? Herewith a few hints for your reading pleasure, the first a brief overview of lycanthropes from HALLOWEEN FOREVERMORE, by Donna Marie West, that can be seen by pressing here, followed by a second piece pointing up the three distinct classes of werewolves courtesy of GODS AND MONSTERS to be found here. Then finally a related case history – or is it? – an article on the 18th century Beast of Gevaudan in France by Jamie Hall via THE CRYPTID ZOO which can be be read here. Another theory on what the Beast really might have been, incidentally, is offered in the very good French film LE PACTE DES LOUPS, a.k.a. 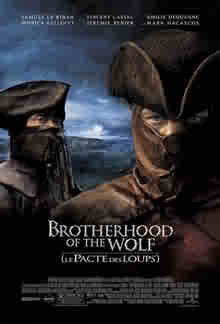 BROTHERHOOD OF THE WOLF. To all, a stellar Holiday Season! But for those perhaps a bit melancholy, for Christmas can sometimes bring that feeling too, press here for a story for cheering up — for no matter how bad things might seem now, somewhere, at some time, things always could be worse. “The Worst Christmas Ever” was originally published in DARK JESTERS (Novello Publishers, 2006), with the version here appearing in FLASHES IN THE DARK on Christmas Day, December 25 2008. It has never been posted on this blog before, but did get a mention earlier this year (February 2 and January 31) as having been accepted as a reprint for a charity anthology, but which to my knowledge has not been published. Then for those with more poetic, um, tastes (depending, to be sure, on one’s personal dining habits), herewith a short verse on a more upbeat note, written just yesterday, Christmas Eve. Read and enjoy! And to all, my best for a truly happy Christmas and year to come! 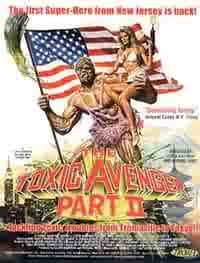 Be that as it may, there are others that fit more easily into standard horror, including some that were also cited on HALLOWEEN FOREVERMORE’s “Top Five” list on December 3. So view at your own risk by pressing here. Dead Lines Picked for Daily Science Fiction; Speaking of Christmas, How About a Small Clutch of Legends and Tales? In the late morning hours of December 23 an early Christmas present has come, an acceptance for my “Casket Girls” themed (cf. April 17, 10, et al.) story “Dead Lines” for DAILY SCIENCE FICTION. This will be my fifth for DAILY SF, at I think just over 1000 words (DAILY SCIENCE FICTION likes ’em short, for quick, convenient Internet reading), this one having to do with the still youthful appearing New Orleans grande dame Lo, and what she might know about the disappearance of one Mr. Valdemar. Then, speaking of Christmas, this is something I came across Monday from Selah Janel via MOCHA MEMOIRS PRESS AUTHOR BLOG via Facebook. It’s not very long and the legends are simple and sometimes sweet, yet may inspire for horror too. I especially like “The Christmas Spider” myself. As for Mocha Memoirs Press (what’s that? 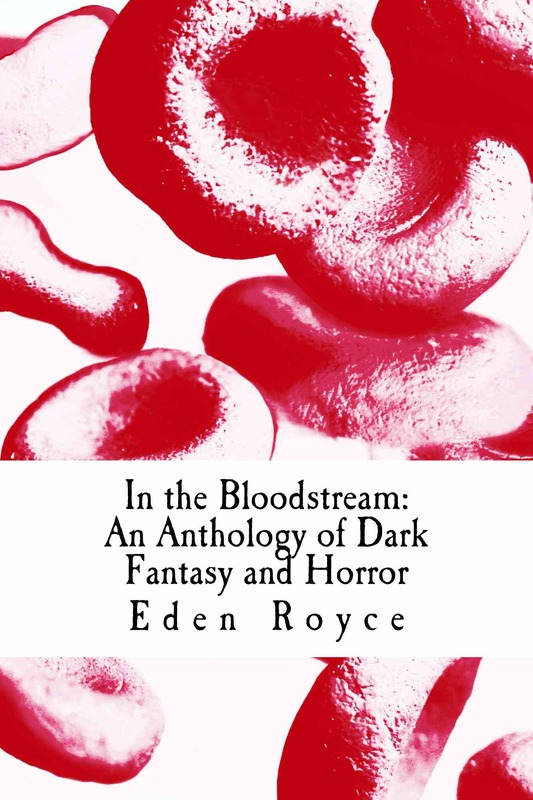 ), they’re best known by me as the publishers of IN THE BLOODSTREAM: AN ANTHOLOGY OF DARK FANTASY AND HORROR with my Lovecraftian/Dickensian spoof “A Christmas Carnage” (see October 28 2013, et al. ), a tale of a young man and his greedy encounter with the Ghost of Christmas Present, a.k.a. his “umpty-umpth-great” aunt Carol, the one who had once been an artist’s model in Paris (and had those amazing pictures taken). So you see, it comes back to Christmas after all. And so to see Christmas Legends and Tales for oneself press here. Or for more about IN THE BLOODSTREAM press here. *For those interested in my previous stories in DAILY SCIENCE FICTION, enter my last name, Dorr, in the search box midway down on the right to unearth them in the archives. Okay, Suzie Wargo Lockhart, as co-editor with Bruce Lockhart 2nd of Horrified Press’s 2013 anthology NIGHTMARE STALKERS & DREAM WALKERS (cf. April 18 2014; November 1, October 23 2013, et al. ), is obligated to give it good marks, but how’s this for a sort of chain review via repeated comments on Facebook? The occasion is to announce to the authors that there will be a royalty coming early next year, but it also gives a précis of the contents that may set readers’ palates tingling, in which case more can be found via Amazon by pressing here. Or, from the horse’s mouth as it were, the Facebook page can be found here. 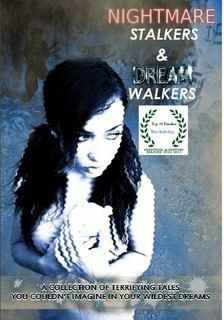 Chantal Boudreau’s ‘Desperate Dreams’ shows us the true meaning of sacrifice, and Lindsey Goddard’s tale, ‘Gateway Drug’, warns us not to talk to strangers-oh, and to be careful what you wish for…if you think women can’t write horror, then dare to check out their stories in Nightmare Stalkers & Dream Walkers! Mark Slade’s story ‘Whispers’ features a man slipping into insanity, and author Kenneth W. Cain offers up a wartime tale not to be forgotten, entitled ‘The Patrol’. Local author Sean Farren haunts us inside an old mansion housing memories best forgotten in ‘The House on Cedar Street’, and acclaimed international poet Mathias Jansson offers a glimpse of a character questioning his identity in ‘A Shadow’. Amazing author of zombie novels such as ‘FLESH EATERS’, Mr. Joe McKinney blew us away with his story ‘Mr. Creator’, and the multi-talented Kate Seren Monroe offers a creepy steam-punk-type tale entitled ‘Dialogues with the Dead’. Joel Kremer’s poem ‘Knock Knock’ kicks things off by sending chills down your spine everytime you hear a knock on the door, and Ben Pienaar’s story, entitled ‘Dreamer’, might make you question your own reality. Congratulations to the authors of Horrified Press anthology ‘Nightmare Stalkers & Dream Walkers’, who will be starting the New Year with a royalty payment for their excellent work. Well done guys, and well deserved! If you remember, this anthology won 2nd place in last year’s P & E Reader’s Poll (anthology category). After moving into a new apartment building, a man gets more than he bargained for in Rebecca Besser’s chilling story ‘Chosen’, and Max Booth III combines horror and romance in ‘7 HOURS’. K Trap Jones distorts a fairytale in ‘Seven Snowy Deaths’, and Joseph Pinto’s ‘Apep’ slithers into the catacombs of your subconcious. Flowers will never hold the same meaning after reading Justin Tate’s poetry, and Todd Nelsen plunges the reader into a bleak future in his story ‘Virtual Black’. This is another overseas publication, this time from Australia, for which the word travels slowly back to the computer cave — in this case by an almost chance encounter on the internet. 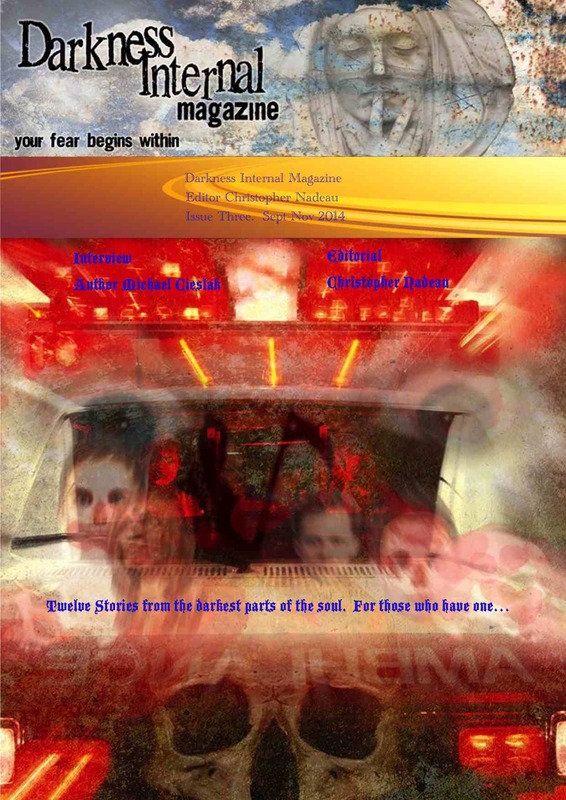 This is the VOLUTED TALES themed issue DARKNESS INTERNAL 3 with my reprint story “Extinctions”(cf. May 27, September 9), for more on which — or to see what I have seen — one may press here. As for “Extinctions,” it’s an odd little tale originally published in THE BLUE LADY for Autumn 1996, concerning a man who reads newspaper headlines — lots of newspaper headlines current at the time the story was written — and has a job in a nuclear power plant. He also has taken up astronomy as a hobby and has become convinced the Earth may be destroyed on New Year’s Eve 1999. He’s also interested in mass extinctions. “Playing together, they syncopated, their melodies weaving. Trading crescendoes. I might note the “fantasy world” is that of the Tombs, of which I’ve written a number of stories (ah, now comes the plug) including three that appear in THE TEARS OF ISIS. (Also one can be found in STRANGE MISTRESSES: TALES OF WONDER AND ROMANCE and three in DARKER LOVES: TALES OF MYSTERY AND REGRET, among various other publications, for more on which one can click on their pictures in the center column). And more immediately, the “nemonymous” nephew’s review can be read in its entirety by pressing here. Less than two weeks until Christmas and children’s heads are filled with visions of. . . ? Surely not these, a collection of thirteen horror toy commercials from decades past as aired along with cartoons on cold Saturday mornings, brought to us courtesy of Terry H. West via the latest HALLOWEEN FOREVERMORE. My favorite of these is “Toxie Toys” though others are fun too (alas, however, beyond my time as I was already too old when most of these toys were being sold), and there’s even one we’ve seen before, “Baby Laughs A Lot” (cf. November 26, second post re. “Ten Terrifying YouTube Videos”). Other favorites for me include “Creepy Crawlers” (watch, especially, for the cat), “Mad Scientist Monster Lab” (with its “too gross!” refrain), and the game “Stay Alive” as narrated by none other than Vincent Price. Along with the links to the ads themselves, dating originally from the 1950s to the1990s, is an introduction by Terry noting how times change, the Saturday morning TV-time ritual gone forever and possibly not even able to be understood by the kids of today. But we, we’re old enough, aren’t we, to share at least in these memories of times past? To do so, press here.